Living organisms are characterized by their ability to reproduce. Reproduction is a biological process where the living organism produces new individuals of the same kind and thus ensuring its continuity. In this process, the genetic traits move from parents to offspring. Asexual reproduction: this occurs by only one living organism. It mostly occurs in single-celled living organisms such as budding in yeast and binary fission in Amoeba. Sexual reproduction: this occurs in higher living organisms of plants and animal. It occurs through two living organisms, one of them is a male and the other is a female. 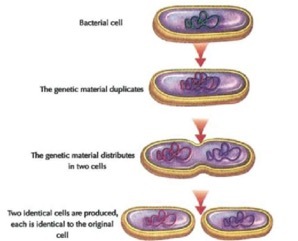 This is a type of asexual reproduction that occurs in unicellular living organisms. The nucleus is divided by mitosis and then the cell which represents the body of the unicellular organism splits into two cells. Each one becomes a new individual. This type of division occurs in unicellular protozoans such as Amoeba, Paramecium and Euglena and also in simple algae and bacteria. This occurs in unicellular living organisms (such as yeast fungus) and multi-cellular organisms (such as Hydra and Sponges). 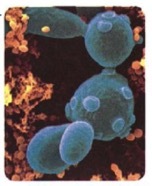 In yeast, the bud emerges as a lateral bulge in the cell, then the cell nucleus is divided (by mitosis) into two nucleoli. One of them remains in the parental cell and the other immigrates to the bud. A bud grows gradually and remains connected to the parental cell until is fully grown then separates from it or remains to form a colony. Regeneration is the ability of animals to compensate their missing parts. The living organism can reproduce one of its parts. For example, starfish arms can be regenerated and create a complete animal if they contain a part of the central disc of the animal. This type of asexual reproduction is more common in some fungi such as bread mold, mushrooms and some algae, where they have special organs called sporangia (a singular sporangium). Each sporangium has a large number of spores that release after rupturing its wall. When spores find a suitable environment, they start growing to create a new organism. Plants reproduce vegetatively, without needing seeds, using their vegetative organs such as leaves, roots and stems, and their cells (tissue culturing) in order to produce new plants very similar to the parent plant. Vegetative propagation in plants includes cell’s mitotic division. From all of the above, you can see that asexual reproduction produces offspring identical to their parents. The similarity in the genetic structure of the resulted offspring is caused by mitosis. The new offspring gets a full copy the parental individual’s genetic traits. Thus, no genetic variations occur, causing no differences in the resulting offspring from the original organism. This is the most common type of reproduction, especially in the higher living organisms. Sexual reproduction occurs between two parental individuals. One of them is a male and the other is a female. Sexual reproduction depends on two main processes; formation of gametes and fertilization. Gametes in organisms are formed as reproductive cells by meiotic division. Gametes resulting from this division contain half the number of chromosomes (N) of the organism’s somatic cells. This means the combination of the male gamete (N) and female gamete (N) to form a zygote (2N) which contains the normal number of chromosomes of the organism. This zygote contains genetic material from each parent. When it grows, it gives a new offspring whose traits combine each parent’s traits. Sexual reproduction is a source of genetic variation. The offspring resulting from sexual reproduction get the genetic traits from two sources; one of them is the male parent and the other is the female parent. This means that the resulting offspring have new genetic traits that combine the parents’ traits. Thus, sexual reproduction is a source of genetic variation.